Pumpkins in January? This quilt has been in the making for a while. Way back in September I wanted to make a Halloween quilt, but could never come up with a design idea that I liked. 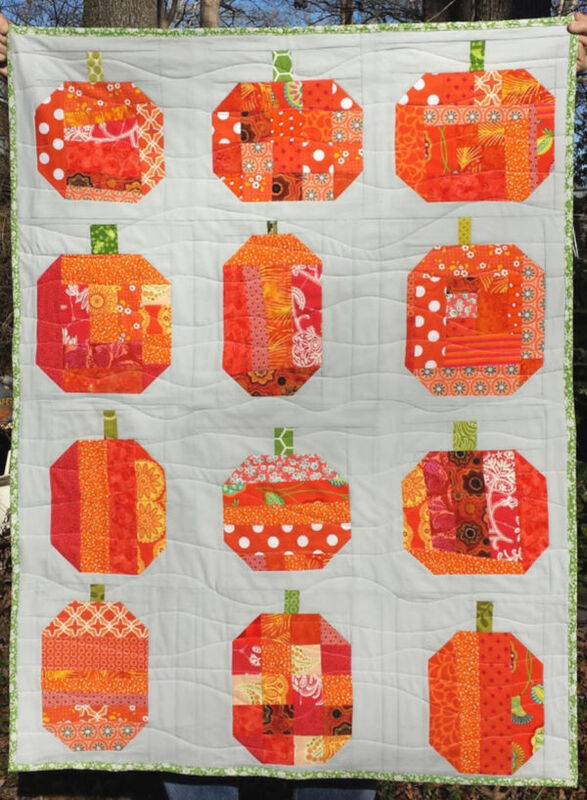 Then finally in October I saw the pumpkins quilt over at Cluck Cluck Sew, and around the same time I was making blocks from the Farm Girl Vintage book by Lori Holt which includes a patchwork pumpkin block. So I shifted gears to a "Fall" theme rather than Halloween. This idea was perfect because I really want to use my scraps and this definitely made a dent in the orange bin! 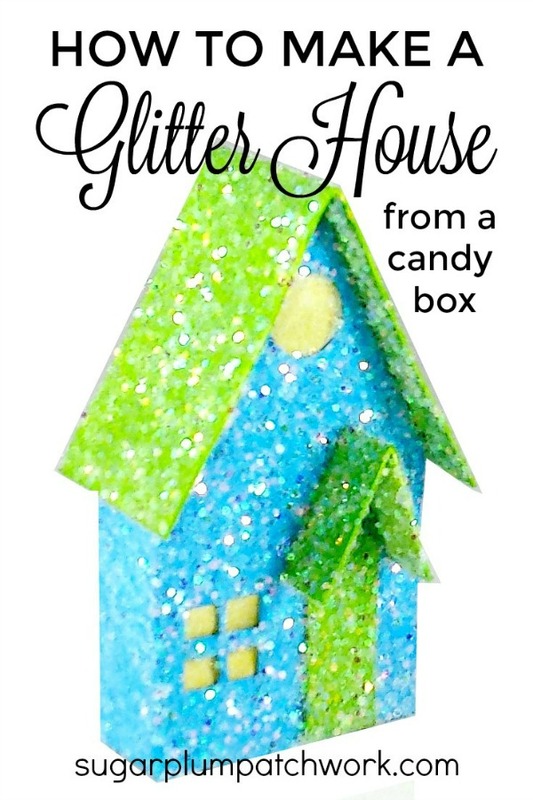 These glitter houses, or putz houses, are so sweet and fun to make, and when a little candy box found it's way into the house I was inspired to transform it. I moved my glitter houses to a curio cabinet in the living room. They had been on shelves in my studio - some of them for two years - and I was concerned about them becoming dusty. It would be hard to get the dust off the glittered surface. 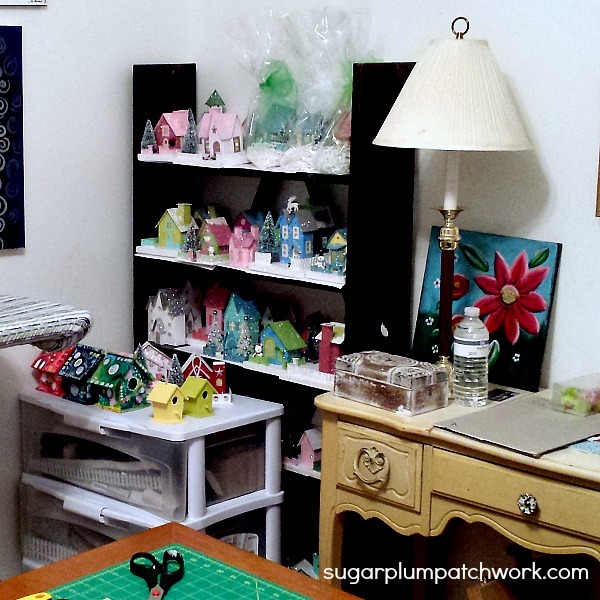 I loved seeing them in my studio (which is a small bedroom in our house), but felt like they needed to either be packed up in plastic storage bins or put inside a cabinet. 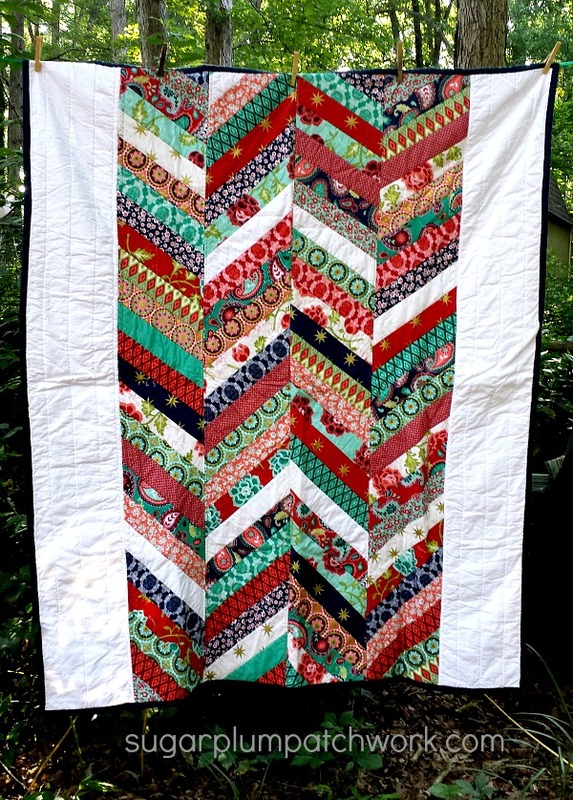 My most recent quilt finish is this herringbone quilt. This is one that was started over a year ago and just finally finished. 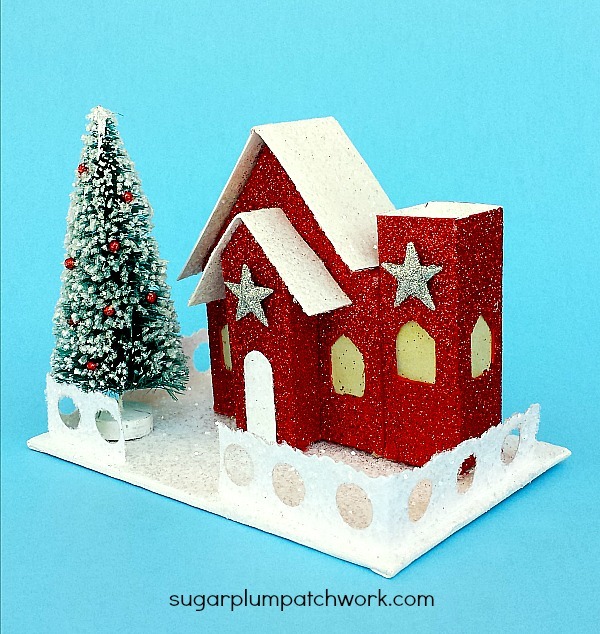 Angled view of the completed red glitter house. I have been inspired to make a glitter house with this fine red metallic glitter for a while now. I kept being drawn to the red glitter every time I walked by that section at the craft store. Finally, I decided to buy it. It kept calling to me - so why not? This is watercolor and that's a change for me - I usually paint with acrylics. But this was definitely fun to try. It's a wet into wet technique and it is fun to watch the colors flow and blend. Kind of meditative to do. I used my Koi pan watercolors and a waterbrush. So much less to set up and clean up than with acrylics. I just needed my paper, watercolor set, waterbrush and a paper towel! Simple. 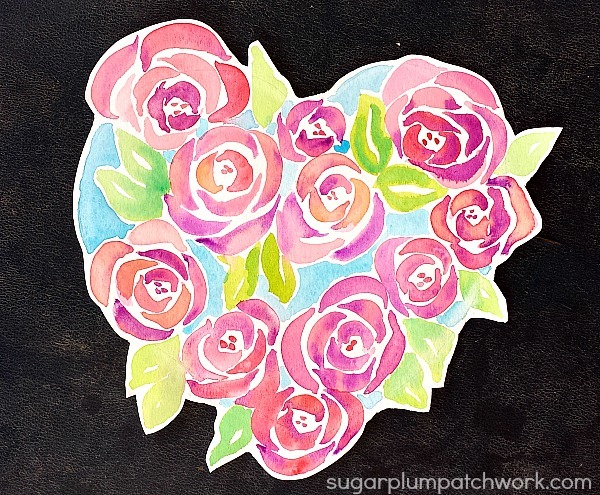 These watercolor roses in a heart shape was a fun try at a tutorial video from Melanie April Art. 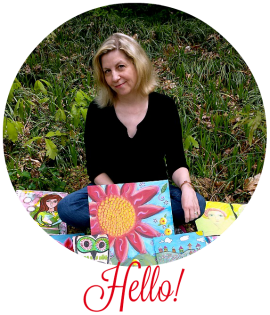 She is a watercolor artist and has some amazing art work and classes. If you want to learn watercolor- check her out! What's working for you lately? 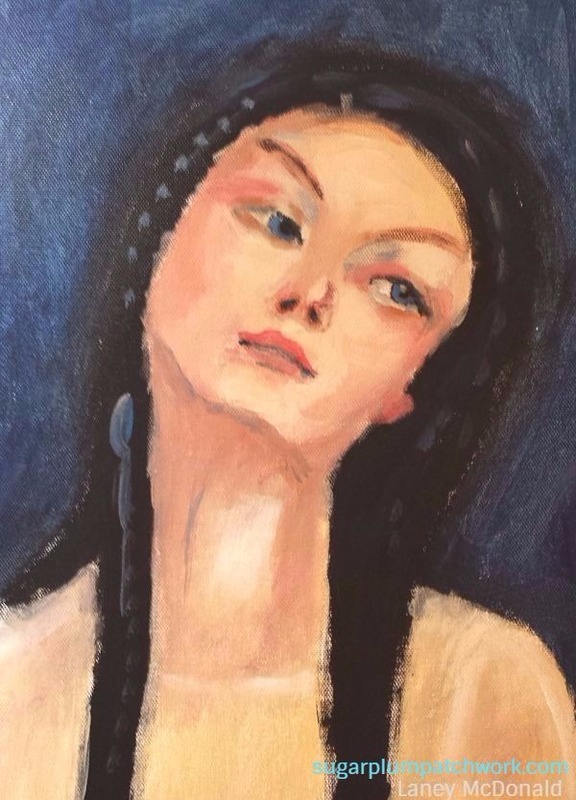 Hope you have a creative weekend! Thanks for stopping by and for your comments. This is my newest glitter house. 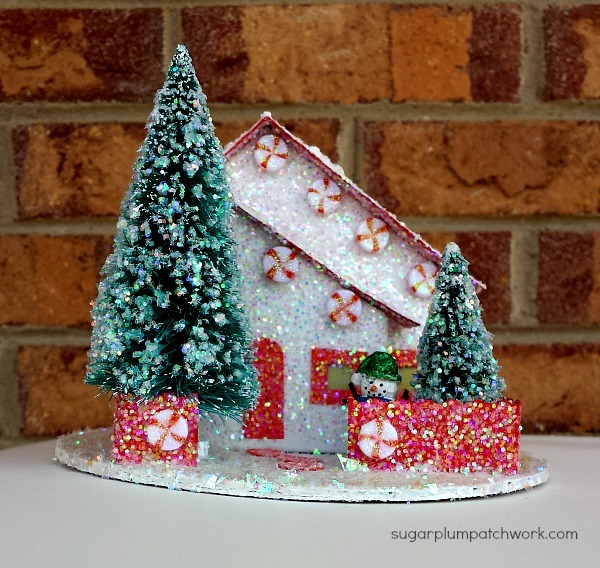 I am calling it the Peppermint Putz House since it is decorated with tiny peppermints They're not real, of course. I had a pack of these hiding in my glitter house decor drawer. I usually refer to these as "glitter houses" but I can't resist the alliteration of "Peppermint Putz!"